A recent report indicated that the pharmacodynamic interaction between clopidogrel and vonoprazan leading to attenuation of the anti-platelet effect of clopidogrel was unlikely to be caused by the inhibition of cytochrome P450 (CYP) 2B6, CYP2C19, or CYP3A4/5 by vonoprazan, based on in vitro CYP inhibition data. The current report investigates another important antiplatelet inhibitor, prasugrel, that is also activated through metabolism by CYP2B6, CYP2C19 and CYP3A4/5, for its CYP-based DDI potential with vonoprazan. The report describes in vitro metabolic inhibition assessments using radiolabeled prasugrel and human liver microsomes (HLMs). 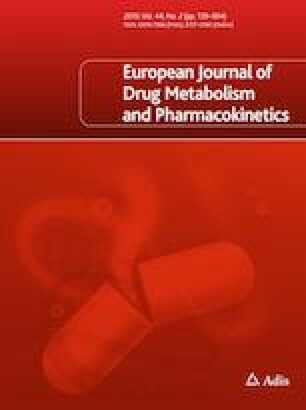 Reversible and time-dependent inhibition studies of vonoprazan as well as esomeprazole on the formation of the active metabolite R-138727 of prasugrel were conducted using HLMs. Vonoprazan up to 10 μM, a concentration over 100-fold higher than the clinical maximum plasma concentration (Cmax) of 75.9 nM after 20 mg once daily for 7 days, did not significantly affect the formation of R-138727 from [14C]prasugrel via reversible or time-dependent inhibition. The in vitro data show that the pharmacodynamic interaction reported in the literature between vonoprazan and prasugrel is unlikely to be caused by CYP inhibition by vonoprazan. The results were similar to those obtained from the study with clopidogrel. The online version of this article ( https://doi.org/10.1007/s13318-019-00554-y) contains supplementary material, which is available to authorized users. These studies were supported by Axcelead Drug Discovery Partners, Inc. in Japan. The author would like to thank Yuan Josh and Suresh K. Balani of Global Drug Metabolism and Pharmacokinetics, the Global Vonoprazan Project Team members at Takeda for their contribution to these studies. M. Nishihara wrote the manuscript, designed the research and analyzed the data. All studies reported here were supported and conducted by Takeda Pharmaceuticals International Co. The author is an employee of Takeda Pharmaceuticals International Co. The author declares no other conflict of interest. The study was followed by the applicable institutional guidelines.